In my review for the Pacific Rim Blu-ray, I mentioned that 2013 has been one of the most divisive years in terms of films. Many films which were praised by the fan community were torn apart by many critics and vice versa. One of the most divisive of these pictures was Man of Steel, Warner Bros.’ first chapter in a shared live-action DC universe. I think the film itself mostly works, you can read my original review by clicking here, but I think I love the additional content on the film’s Blu-ray more than the movie itself. Man of Steel‘s Blu-ray features two separate discs. The first contains the feature film along with three in-depth special features for the film. One of the more interesting features included on this disc is a dissection of Superman’s entire history and how the filmmakers took those aspects and transformed them into the story we see in the film. What’s particularly interesting about this bit is hearing the enthusiasm in the voice of the creative types ranging from Zack Snyder and David Goyer to Geoff Johns. All of the people interviewed in the featurette have an immense passion for Superman and it’s contagious. I would suggest watching it before venturing into the feature film. The next big featurette on the first disc, while interesting, really has no need to be nearly half an hour long. Titled “All Out Action,” the featurette goes into the workout routines for stars Henry Cavill, Michael Shannon and Antje Traue, in addition to some peeks at the stunt work for the film. It’s cool to see the things these actors did to get their bodies into “superhuman shape,” but at a point it feels like a filler feature in lieu of more interesting behind-the-scenes content. One more shorter featurette revolves around Dylan Sprayberry (young Clark Kent) interviewing the visual effects supervisor about some of the designs and the more complex visual shots, again kind of filler but it still holds some interesting answers about the making of the film. Also included on the first disc is the 75th anniversary short, directed by Snyder which you can watch by clicking here. In addition, there is a featurette for The Hobbit about the various New Zealand locations that have been transformed into Middle-earth – it’s kind of baffling why it’s included. The second disc for Man of Steel is where the real meat of the additional content is located. 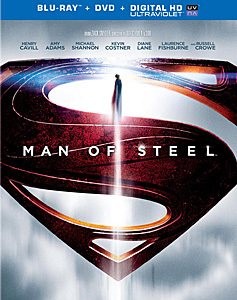 Titled “Journey of Discovery: Creating Man of Steel,” the featurette plays the movie while simultaneously showing off behind-the-scenes footage, visual effects tests, and interviews with the cast and crew. Unlike previous attempts at “pop-up” features that play during the film, this is a more immersive experience that is captivating, interesting, and informative. I wasn’t crazy about this style of special features, as opposed to individual videos, but the more I watched it, the more it grew on me. I don’t know that I’m ready to surrender individual featurettes solely to this format just yet, but it’s certainly a style I could get used to, especially for films I adore. The other main featurette on the second disc is titled “Planet Krypton” and is a faux-documentary about Kryptonian life, the planet, their customs and more. What is really appealing about this meta-featurette in particular is how it plays exactly like a show you’d find on the History Channel, overly dramatic narrations and all. It remains to be seen if this featurette is considered “canon” for WB’s cinematic universe, but if so, it contains many a DC Easter egg. Man of Steel‘s Blu-ray features some of the most interesting special features on a home video release that I’ve seen this year. It is also a visually and aurally flawless HD transfer, but at times the spectacle of it is thrown off by the clearly fake effects. It’s interesting what aspects of the facade of movie making appear totally real on the big screen, but when put on the microscope that is a television contain only a fraction of the realism. Does this detract from the experience of watching the film? Only slightly, but the story’s break-neck pace is what maintains its momentum and forces you to pay attention. Will the Man of Steel Blu-ray win over people that didn’t like the film? It’s possible. At times I felt the special features were more interesting than the movie, but not everyone will share my opinion on that. I was worried that I wouldn’t enjoy the film as much on repeat viewings, but after dissecting the Blu-ray and watching the bombastic action sequences, I can say with certainty that I like the flick a lot. Fans won’t be disappointed with what Snyder and company have in store for them here.